Receiving votes is a PRIVILEGE of being a Top 20 camera! This means that in order to receive votes, your camera must be one of the top 20 most viewed cameras at that time. Have a favorite broadcaster? Or two? Or three? Show them how much you appreciate them turning their live cam on for you and VOTE for them! That's easy! 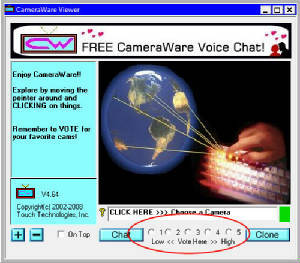 You must be using the CameraWare Standalone Viewer program in order to vote. The voting buttons are right underneath the camera image that you are viewing (circled red in the image below). Note: Votes only count for cameras that are in the Top 20 list (highlighted in yellow in the Channel Menu). Note: If a viewer votes for you when you are not in the list of Top 20 cameras, the vote is disregarded. The same viewer can vote again for you when you are in the Top 20 list - even in the same day. But they can still only vote for you one time per day when you are in the Top 20 list.